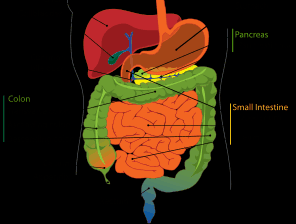 Deep inside your belly, tucked neatly between your stomach and your spine, is a long flat gland known as the pancreas. While most people never give this enzyme-producing part of their digestive system a second thought, when your pancreas becomes inflamed (a condition known as pancreatitis), this forgotten gland can quickly grab your attention by causing painful symptoms like vomiting, sharp abdominal pains and extra-smelly stools. Each year in the United States over 300,000 people will be diagnosed with pancreatitis, with about 5% of these patients succumbing to the effects of the condition. Pancreatitis can be either episodic (also known as short-term or acute) or ongoing (chronic) and is the result of digestive enzymes produced within the pancreas becoming prematurely active, causing inflammation within the gland. Normally, the pancreas produces enzymes which are carried through the digestive track down to the small intestine, where they join with bile from the gall bladder to become activated, helping the body break food down into nutrients. When pancreatitis strikes, these enzymes go rouge and become active before leaving the pancreas, eating the tissue within the gland causing swelling, bleeding and permanent damage. There is no single definitive cause of pancreatitis, but rather a number of known risk factors that increase the likelihood that this condition will occur. Both acute and chronic pancreatitis have been linked to gallstones, high-fat diets, excess alcohol consumption, smoking and high triglyceride (blood fat) levels. Some people suffer from pancreatitis following an abdominal injury, whereas others have autoimmune disorders or blockages of the bile ducts that lead to dysfunction of the digestive enzymes within the pancreas. Acute pancreatitis is characterized with a sudden onset of symptoms that can include an elevated heart rate, nausea and sharp stomach pains that radiate to the lower back. Other signs of this condition can include an inflamed abdomen that feels tender to the touch and stomach pain that gets worse after eating. A diagnosis of acute pancreatitis can be made using a simple blood test – patients with this condition have more than three times the normal levels of the digestive enzymes amylase and lipase (produced by the pancreas) in their blood. Treatment for acute pancreatitis can include antibiotics, anti-inflammatory pain medication and intravenous therapy. Recovery from an acute pancreatitis attack usually takes a few days, during which time the patient cannot eat or drink to allow the pancreas to rest. People who experience repeated acute pancreatitis attacks can develop chronic pancreatitis, the condition which occurs when the pancreas cannot recover from acute attacks. The pancreas is inflamed all the time, leading to ongoing abdominal pain, weight loss, diarrhea and malnutrition due to excess fat in the stool. While there is no known cure for chronic pancreatitis, people with this condition usually receive treatment to minimize the symptoms and slow the damaging effects of the dysfunctional digestive enzymes. Alcohol consumption is to be completely avoided and patients are often advised to follow a low-fat, low-protein diet to minimize the activation of digestive enzymes within the pancreas.